There is news that Victor Valdes might join Manchester City in the summer. The player who played under Pep Guardiola while he was the Barcelona manager will love to be reunited with his former manager. Guardiola, who will be taking charge of Manchester City next season, is interested in bringing Valdes to the club in order to bring some competition to Joe Hart. The goalkeeper who is currently available on a free-transfer after being released by Standard Liege will be glad to return to the Premier League after enduring a poor spell at Manchester United. Indeed, the Spain international has had a miserable career with Manchester United where he only managed to make two appearances in the first-team. There was constant conflict between Louis van Gaal and Victor Valdes during this time at Manchester United. The Dutch manager accused Valdes of refusing to play with the reserve team which Valdes denied. The relationship between Victor Valdes and Louis van Gaal deteriorated so much that he was not given a locker and was not allowed to train with the Manchester United U21 team. Ultimately Victor Valdes was loaned to Standard Liege and was released when his contract was over. He will have a point to prove in the Premier League and will want to reconnect with a manager that he has enjoyed working with. 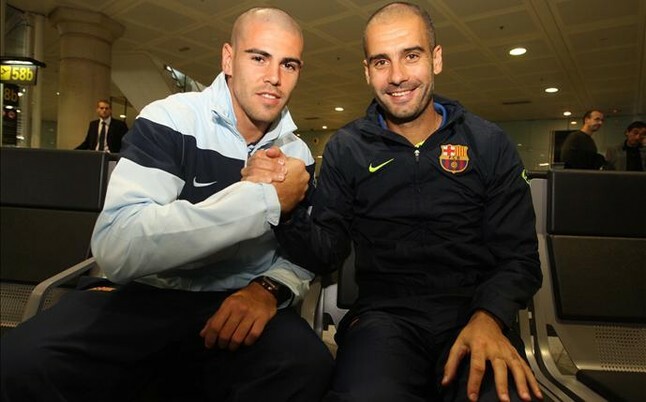 Indeed, during his time at Barcelona, Victor Valdes has won the Champions League and La Liga and will hope that they can replicate the same form at Manchester City. Manchester City currently have a shortage of goalkeepers after the release of Richard Wright. Additionally, it is believed that their number 2 keeper Willy Caballero might be leaving Manchester City in the event that their former manager Pellegrini finds a new job.